The story is very violent and bloody and there are scenes of torture that may upset readers of a more sensitive nature but they had to be included because they were very necessary to the very detailed story. The tension between the different personalities and the excellent characterisation make this a highly enjoyable thriller. This is the fifteenth book in the series about Dan ‘Spider’ Shepherd and thirty-sixth overall of his titles but it could easily be the first as the author is so adept at his craft that there is a freshness to his writing which makes it truly exceptional. As a former journalist for ten years on newspapers such as The Times in London and The South China Morning Post in Hong Kong before becoming a novelist, the author is highly skilled in researching in depth before writing his stories and the authenticity of that highly detailed research is clearly shown in the meticulous descriptions and prose of his stories. 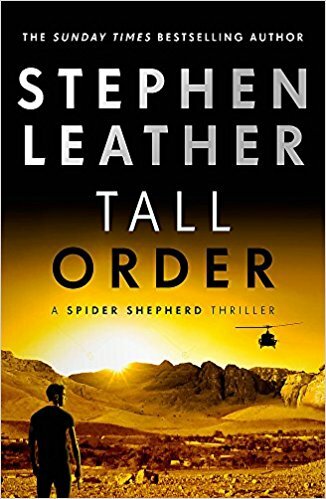 It is not a handicap to the new reader that this is Leather’s fifteenth book in the “Spider” Shepherd series as full explanations are given about all the characters and aspects of the plot. Stephen Leather is one of the UK’s most successful thriller writers, an e-book and Sunday Times bestseller and author of the critically acclaimed Dan ‘Spider’ Shepherd series and the Jack Nightingale supernatural detective novels. Born in Manchester, he has been writing full time since 1992. His bestsellers have been translated into fifteen languages and several of his novels have been turned into films. In 2011 alone he sold more than half a million e-books and was voted by 'The Bookseller' magazine as one of the 100 most influential people in the UK publishing world. This seasoned writer is at the top of his game and immersing yourself in his world is deeply rewarding as it is a spellbinding and quite brilliant read. TALL ORDER is an extremely enjoyable book and a rattling good read. It was well written and therefore easy to read, even though it is quite lengthy at 400 pages but it is very cleverly plotted and I was completely gripped until the final exciting paragraph. I believe that this was the author's best book so far.